These board games are based on historical events or different periods in history, from prehistoric times right up to recent times. You assume an identity and attempt to achieve your goal, all while trying to maintain as much historical accuracy as possible. Related categories include Railroad Games, Strategy Games, and War Games. In Alexander the Great - Founder of an Empire, players follow the young Macedonian King and his small but effective army on their long campaign of conquest in the East. They march with him through the Near East to Persia, and then well into the Indian Empire. On the way, enemies are subdued, cities are founded, and magnificent temples are built. As a result, Alexander will rule a huge empire, where all citizens enjoy the same rights. It's frontiers are the Danube in the West, the Caucasus Range in the North, Egypt in the South, and the Himalayas in the East. If this young visionary hadn't become ill and died much too soon, he would have surely expanded his empire further West as he was preparing to. In Alexander the Great players earn points for conquering provinces, building temples and founding cities. The winner is the player who has the most points at the end of the game! Journey forth from the homeland, which produces wood, stone, tools and cloth, from which to build ships used in the acquisition of resources. Resources enable you to increase your population and develop your settlement into a city. Be prepared for pirates as you strive to aquire wealth and power. A game for 2-4 players. This game design is based upon the popular electronic game title, artfully executed by the master of Catan, Klaus Teuber. In Castle Merchants, players take on the roles of merchants during the Medieval period trying to sell their wares to the various castles in the land. Each castle has certain goods they are interested in obtaining and the first merchants to visit a castle receives a better profit for their goods than the late comers. Driving their horse carts around the countryside, the merchants have to navigate different paths as the landscape changes during their journey. It will be up to each merchant to decide the best course of action and path to take. One thing they all have to be wary of is unstable regions where a rock slide can make a path impassable. The first merchant that manages to fill their purse with 18 gold pieces wins the game! The 19th Century has arrived and America is heading west. Settlers form wagon trains and create long trails as they leave the east behind. Their goal as they strike out towards the fertile land of the vast prairies is to grow crops and claim grazing lands for their hungry herds of cattle. As more people head west, new cities pop up. But the vast distances between them require a new form of transportation for vital goods...the railroads!In Settlers of America: Trails to Rails, you'll experience the pioneer days of the old west! A large and beautiful map of the United States utilizes the simple yet fun Catan hex-tile system of play. Players collect and trade resources in order to purchase and move settlers, build cities, lay rails, and acquire and move trains. Rail links allow them to acquire gold, which allows them to buy resources and use other player's rails. Fulfill your manifest destiny by being the first to use your trains to deliver 8 goods to your opponent's cities and win the game! In 1835, the British East India Company established a commercial office near the city of Darjeeling, home of the most sought-after tea varieties in the world: Darjeeling. Players will cross the entire region in search to gather the largest shipments possible for each individual tea variety in the region. The latest teas to be loaded are worth more victory points than older ones, as tea connoisseurs prefer the freshest cargo. Preferences for each tea variety also earns the players victory points when they are loading shipments. The amount and freshness of each variety of tea, and also the popularity of the teas will be determining factors in the outcome. The game ends as soon as one player has reached 100 victory points. You assume the role of a monarch, as your parents before you, who rules a small and pleasant kingdom. Unlike your predecessors, however, you are not content with the quaint kingdom, and you set your sites on expanding your empire. Unfortunately, you are not the only monarch in your area with the idea, and soon you are vying for fiefs, freeholds, and feodums - all for the taking, as you attempt to unite them under your banner! In order to win, you must race to claim the land, while simultaneously fending off your competition. By hiring minions, constructing buildings, renovating your castle, and stocking your treasury, you may find yourself the victor in Dominion! In Dominion, you assume the role of a monarch, as your parents before you, who rules a small and pleasant kingdom. You desperately want to expand your empire. Alas, you are not the only monarch in your area with with expansion on the mind, and soon you are vying for fiefs, freeholds, and feodums - all for the taking, as you attempt to unite them under your banner! Dominion: Intrigue can be played as a stand-alone game for up to 6 experienced Dominion players or, as an expansion to Dominion with rules for playing with up to 8 players at two tables. Included are 25 new Kingdom cards and a full set of Treasure and Victory cards. The Viking Stronghold Eketorp, on the Baltic Island of Oeland, is in need of a strong fortress against enemy attacks! You must fortify your tribe against not only invaders, but your fellow Viking neighbors as well. Since materials were not always plentiful, plundering from Viking tribes was common. Materials such as grass, wood, clay, and stone are used for constructing and maintaining the castles for each tribe. Obtain the most valuable building blocks for your fort, protect your walls and make it to the end of the game as the viking chief with the strongest fortress. The King is dead, and there is no clear successor! And your eyes are set on the throne. To be victorious in the coming succession struggle, you must spread your influence across the countryside. Every area you capture brings you one step closer to the crown! Your foes will field a set of pieces identical to yours, so you will need to outwit and outmaneuver them to succeed. Fealty is a game of positioning and territory control. Each turn, all players add one piece to the game board, with increasing constraints on placement as time goes on. Weighing the choice between capturing valuable cities or larger swaths of forests and fields will be a key concern. Every game will vary, as there are twelve 6x6 duchies that will fit together to form the kingdom. The player who has maneuvered their pieces to place the most influence onto the board wins! Giant walls protect the city of Hamburg against the ravages of the Thirty Years War during the 17th century. In Hamburgum, players guide families of Hamburg in the pursuit of wealth and prestige. Hamburg is the perfect place to do so as the city is largest and most prosperous in all of Germany. Products the families make to sell overseas include sugar, cloth, and a German specialty, beer. Players compete for the best building sites and the best berths for their shipping vessels. Ultimately though, they are competing for the most prestigious church donations as prestige decides the game. A great strategy game where actions are selected according to simple rules on the rondel on the game board, the reverse side of which offers another city, Londinium, and a different strategic challenge. Hector and Achilles - The Trojan War is a colorful, exciting and fast playing card game for two players set in the times written about by Homer. One player leads the Trojan army, the other the Achean army. In a series of battles the players try to beat their opponent. Famous heroes of the Iliad are helping them achieving their aim. In ancient Egypt, great kings struggle for control of the fertile Nile river valley. In Horus, you are one of these kings whose goal is to earn the invaluable favor of the falcon-headed god Horus. Seize your destiny and reign supreme over the land of Egypt! Discover your inner Pharaoh with Horus, as players journey to ancient Egypt's sacred Nile valley in a struggle to control the land of Kemet. Guide the course of the sacred river, cultivate the land surrounding it, build a holy necropolis to thwart your foes, and earn the blessings of the Horus temple as you seek to unite the valley into one great kingdom! In the 15th century, Cosimo de Medici aka ''Il Vecchio'' ruled over Tuscany and its capital Florence. Players represent the heads of Florentine families trying gain power for their own familiies, by sending out their family members to recruit followers (knights, assassins, abbots) and collect money as both are needed to take control of provinces in neighboring regions. Players also gain the favor of the squirearchy which is indispensable when it comes to getting an official and influential position in Florence. Will your family rise to the top as a result of your cunning plans? England in the 5th century: a time of great changes and the start of a new era. The Romans have abandoned England and the Saxons are conquering the island. Christianity is still weak and struggles against the old Celtic religion. Power and Weakness takes place in this time of uncertainty. The players try to increase their influence and gain power in the provinces to finally win control over England. They use both conventional fighting and magic. Knights and magicians in their service are sent to the provinces to overthrow their opponents. The challenge in Power & Weakness is to keep abreast of the two very different stages of play: Magic and Sword, each with its own rules and specific tactics. Each player must decide whether to concentrate on the military or the magical field -- or to try to be equally good in both -- in order to attain power and gloat over the weakness of the opponent. It's 1543, and Puerto Rico is beginning to blossom. You have the opportunity to become very wealthy by owning the most fruitful plantation. Carefully decide if you need to play the role of settler, mayor, builder, craftsman, trader, or captain to grow your plantation. Puerto Rico is an exciting game played over several rounds, with players choosing one of the seven roles in the game. Each role allows a player to do a specific action. For example, the settler may take a quarry tile; the mayor may place a colonist; a builder can build a building for less; the craftsman gets one additional good; a trader may sell one good, and finally the captain loads his goods on to the ship to the old world first. Each player is a Renaissance Man, skilled as a Scholar, a Merchant, a Knight, and a Baker. The goal is to train, hire, and recruit others, aiming to produce a Master of one of these 4 areas of study. A little luck will help along the way, but the day will surely go to the player who finds the most clever ways out of the trickiest situations in Renaissance Man! Seeland takes place in the Dutch Golden Era and comes with a beautiful board showing windmills and dikes in a green countryside. The Dutch Republic urgently needs new cultivation areas in order to harvest more crops. Be means of splendid mills they want to wrest more land from the sea. In Seeland, players assume the role of wealth Dutch merchants and invest in the land reclamation at the gates of town. In order to make proper use of the seeds and the building timber you have to proceed tactically on the market without losing sight of the most fertile fields on the game board. 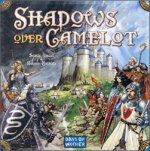 Shadows Over Camelot is a unique collaborative game featuring a malevolent twist! As the incarnation of the Knights of the Round Table, you join forces against the game itself in an attempt to protect Camelot. But beware, all is not as it seems among these noble Knights. One of your number might yet turn out to be a traitor-in-waiting, biding his time while sowing havoc and destruction from the shadows! Featuring a richly illustrated gameboard of Camelot and its surroundings, finely carved miniatures of the Knights and their foes, and seven Quests to embark upon - Shadows Over Camelot is your gateway to many a memorable game night among friends! 15th century princes from the Loire Valley devote their efforts to strategic trading and building in order to bring their estates to prosperity and prominence. Over the course of 5 rounds, collect the most points by trading, live stock farming, city building and scientific research to win! The game is set in the Middle Ages in France (Burgundy). Players aim to build settlements and powerful castles, practice trade along the river, exploit silver mines, and use the knowledge of the travelling people. This exciting game is challenging and brings out the competition for an evening of fun! In the year 79 A.D., the beautiful city of Pompeii sits at the foot of Mount Vesuvius. For years, the lovely town has attracted the best of Rome's citizens, and it is famous for both its businesses and luxuries. But a terrible secret lies deep beneath the slopes of the mighty mountain. A secret that will unleash unspeakable horrors! Now you must struggle to escape the doomed city, rushing to avoid the constant streams of lave that threaten to engulf your people! Will you be able to save them all? The player with the most survivors will be the winner! In The Great Dalmuti, life isn't fair. One round you're at the top of the heap, and the next you're peasant scum in this fast-paced card game of medieval one-upmanship! Players take their places in the pecking order and try to get rid of the cards in their hands. The faster you do, the higher you'll go. But don't get comfortable, because in a single hand even the lowliest serf can knock you back to the fields. Sound unfair? Sure it is! But the sweet taste of victory could make it all worthwhile. In Mesopotamia, between the Euphrates & Tigris rivers, lies the cradle of civilization. Farmers cultivate the land, traders sell their wares, and priests offer the masses their religious support. As kings seek to lead their dynasties to fame and power, conflicts are unavoidable and only the most clever and successful king will emerge as the winner! This is a card game version of the classic 'Tigris & Euphrates' board game. Egypt 1926. The Valley of the Pharaohs holds many secrets, but none so great as the Scepter of Amun-Ra. In this grand adventure you play a character tasked with collecting the legendary Scepter. As you make your way to the Valley of the Pharaohs you will face desert bandits, blinding sandstorms and the ill wishes of your fellow players. But safe haven and good fortune can be found within the oasis of the friendly Bedouin. If youre feeling lucky you can spin the Wheel of Fate. Collect resources to overcome obstacles or lay obstacles to hinder your opponents. Roll doubles and you control the mummy, but beware no one masters the mummy for long. Valley of the Pharaohs comes packaged in an authentic wooden book-box and is played on a beautifully illustrated map of Egypt. Cast metal playing pieces, metal coins and individual character cards provide rich context and detail to this exciting game of fortune and peril.